What’s it like to run a real-life escape room? In Expert Witness, The A.V. Club talks to insiders about the entertainment business to shed light on how the pop-culture sausage gets made. Escape rooms are places where groups of people are challenged to solve puzzles and find objects needed to get them out of a room in a limited amount of time, all in the name of entertainment. They were unheard-of a decade ago and didn’t spread to the United States until 2012. Now, there are reportedly more than 2,000 worldwide, with 1,000 in the U.S. alone. The themes and horror-factor vary wildly, ranging from “trapping” participants in a sadistic murderer’s lair to having them search for lost treasure in a forgotten temple. 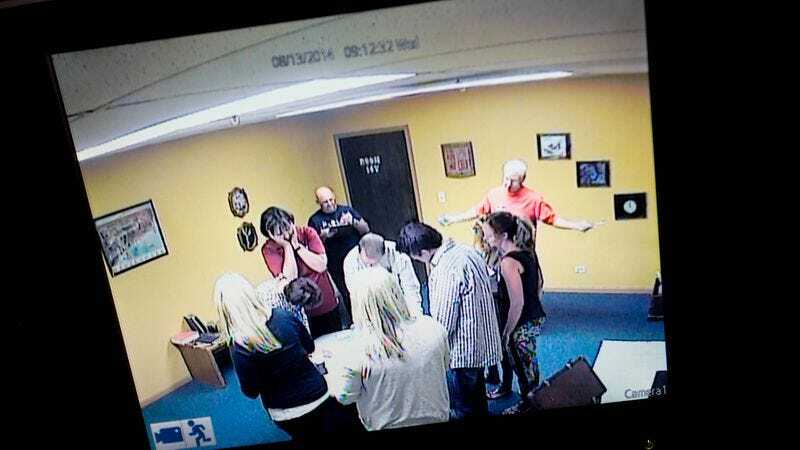 The people who seek them out are equally diverse, as the emphasis on cooperation has made escape rooms attractive not just for horror-buffs and video game fans, but also families, businesses, and church groups. John Bennett and Kristin Mellon opened D.O.A. Room Escape in suburban Chicago in July 2014. Inspired by two of the Windy City’s most notorious crime stories—The St. Valentine’s Day Massacre and H.H. Holmes killings during the 1893 Chicago World’s Fair—their two rooms have proven so popular that the duo is opening a second location in the vacation hub of Wisconsin Dells. The A.V. Club talked to them about winning strategies for escape, coming up with puzzles, and the rush of watching the last few minutes tick down. Bennett and Mellon also provided a discount code for A.V. Club readers that’ll get them 10-percent off a ticket purchase: AVCLUB10. The A.V. Club: What made you decide to open an escape room? John Bennett: [Kristin and I] actually saw something like this when [escape rooms] were first coming out here in the states, and we thought we could enhance it and make it better. AVC: What did you want to do differently? JB: We love ghost stories and history. We thought, “Room escape is quickly becoming popular, but has anyone bothered to do it on real-life history? Something that can be just as fun and intense, but when they’re done with the experience, they’ve learned something?” It’s not necessarily, “Do it bigger and better.” We thought we could make it more specific to real-life events. Kristin Mellon: John and I not only love history, but local Chicago history. We had just learned about the 1893 World’s Fair and H.H. Holmes and it fascinated both of us. I couldn’t think of anything better than to base a room on that. Some people have heard of H.H. Holmes and the World’s Fair. Some people haven’t. When they leave, they’re so thankful that they’ve learned stuff. We needed our own little niche, so we decided on real-life events. AVC: What makes these events effective as the basis of a room escape? KM: The 1893 Chicago World’s Fair was a huge part of history. There were so many inventions that came about from it, a lot of stuff we use today. I never learned about the World’s Fair until four years ago when we went on a ghost tour. You’d think you’d learn about it in school, especially living in Illinois. It was fascinating to me and we both thought it would be fascinating to our customers. We’ve gotten a lot of great feedback, especially with H.H. Holmes. We knew a lot of people didn’t know about it so it was fun for us to be able to design a room around it. AVC: What did you do before this? JB: I was the owner of a commercial refrigeration company and Kristin was a kitchen designer. All our rooms are very cold and well put-together and designed. KM: My design background really helped. AVC: Can you give an example of how you integrate the history into your puzzles? KM: We have some floor plans from [Holmes’] murder castle, and we’ve incorporated it into a clue where the participants have to navigate their way through the floor plan to come up with an answer. AVC: What do the rooms look like? KM: We try to incorporate the real-life story into the room. In the Al Capone room, we had a picture of [where the massacre took place] and it looks exactly like that crime scene. We try to make it look exactly like the events. JB: You feel like you’re back in time and you’re at that crime scene or in that castle. Nothing’s 100 percent, but we do our best. AVC: What kind of research and planning goes into designing a room to fit those time periods? KM: We read books; we’ve talked to people; we contacted H.H. Holmes’s great grandson Jeff Mudgett and invited him to come do the room and he did. We got a lot of great information from his book [Bloodstains] and from talking to him. JB: We’ve done ghost tours in Chicago. We use photos of the scenes. We take every avenue you can think of to find out what it looked like back then and the flavor back then. AVC: What comes first: the puzzles or the decorations? KM: I don’t think either one. We work on them both simultaneously. JB: Kristin has a knack for coming up with awesome clues, and I’m always thinking of how can we incorporate the puzzles—where can we put this on an item that will give them the riddle. The outcome, after many hours of debate between each other, tends to be very successful. AVC: Where do you get your props? KM: Our themes right now are all old history, over 100 years ago. Goodwill, Salvation Army, Habitat For Humanity are great places to find our props. I can look at something now and think of five ways I can use it in one of my rooms. John does the same thing. We like to go shopping. There’s something cool that will catch our eye and we’ll pick it up for $1. We hit estate sales and garage sales also. JB: At the same time we’re starting to use video or electronics more. We’re always looking for the best for the room. AVC: Why are you looking to add electronics? JB: To be an addition to the “wow” factor. Electronics have come a long way, especially in room escape. The groups involved may be able to solve something and then, digitally, something will expose itself. People may need to find items to power up an item. We’re just slowly dabbling with that. AVC: What escape strategies work best? JB: If you don’t work together, you won’t escape. That’s what we love about it. KM: Communication is probably the biggest factor. If you walk around the room with your hands in your pockets and find a thing and solve it but you don’t tell somebody, you waste time. Five minutes later, someone might find it and not know it’s been solved. AVC: What sort of people do escape rooms appeal to? JB: We have seen every facet of people come in. You’ve got attorneys, doctors, and 10-year-olds. AVC: What types of people do best with the challenges? AVC: This concept goes back to “escape the room” video games. How do people who play a lot of video games do with your rooms? KM: We do get the gamers in and they do have the right mentality. And they’re pretty good at it. If they bring the right people, if they bring their other gaming friends, they will escape. We’ve had gamers who get put with whoever else purchased tickets for that time slot. Normally your attorneys and engineers are not very good. They overanalyze things. JB: If you get the right blend of people, the diversity helps. It’s not like we’re saying that this is not a thing for attorneys, but the more diverse team you bring, it seems to work out the best. AVC: How do you know if your puzzles are too hard or too easy? JB: We go through a testing phase. After the room is put together, we have multiple teams come out. KM: If I find or come up with something cool, I’ll run it past John or run it past my kids or my mom and they’ll be like “Yeah, no Kristin, that’s way too hard” or whatever. I’m constantly working on my puzzles and my riddles. I’m constantly striving for perfection. AVC: What makes something too hard? KM: If it’s not something that’s commonly known, if it takes a special skill to solve it. It might be something no one’s heard of before. We don’t want something in the room that requires special knowledge where you’d have to go to class or college. JB: We’d like to incorporate braille or Morse code, but we don’t want to make it impossible to escape if you don’t know it. We might give them a cipher to figure out what we’re saying in braille or Morse code. But sometimes we have people who say, “I was in the Navy, and I was the Morse code operator, and I know what that number is” and they solve that puzzle instantly. AVC: What is the testing phase like? KM: We do some run-throughs, and we’ll sit down with the group afterward. We’ll time it and see how long it takes, and we’ll tweak things. Even when a room is live, we’re always trying to tweak it and make it smoother for our customers. AVC: Do you ever give hints? JB: We have a game master in the room with the groups. They’re there for safety and as a guide. Every team gets two clues or hints during the course of the game. If they’re stuck on something, we’ll help them out. [Sometimes] that’s not needed, as we’ve had so many escapees in the past. AVC: What percentage of groups need hints? KM: Most groups get at least one. There’s a lot of things that they miss. If you don’t look at everything, open everything, turn everything over, you’ll miss something. That’s where they might need a little nudge. The [group members] all have to agree that they’ll take that clue or hint. AVC: What’s it like to sit and watch while people are just stumbling through your puzzles, missing things you think are obvious? KM: We’ve learned to have awesome poker faces because a lot of the time, they’ll look over at us and try to read our faces. They’ll even say, “Oh look, she’s nodding her head or shaking her head.” Sometimes it’s hard because they’re so close and don’t even know it. Sometimes they’ve made us burst out laughing with some of the funny things they’ve said. It’s fun being a game-master. JB: I remember a team that pretty much had everything they needed to escape. The problem was they forgot to go to the escape door. Honestly, with two minutes left they walked around the room wondering what to do with this answer, and I was flipping out. I had to walk out of the room. I wanted to beg them to go to the door. Eventually someone asked “Guys, have we checked what we need to open the door?” They literally opened the door with one second left on the clock. There was such a breakout of laughter and yelling. It was great. KM: A guy kept waving this magnet around saying “I have no idea what to with this.” He was about half an inch from the item it went with and I wanted to just push his arm. About five, six, seven minutes later he finally figured it out. I had to really keep my poker face. AVC: Has anyone asked to be let out because they were too scared? KM: We’ll have people who are mildly claustrophobic or afraid to get in, but the moment they get in there, they’re so focused on figuring things out and solving things that they forget that they’re claustrophobic. We’ve never had anyone need to get out. Knock on wood. So far so good. AVC: What percentage of people escape? JB: As of October, it was 22 percent. It always seems to vary. We had a 10-year-old birthday party get out the other day. If you were to add two minutes, that number would go up to 38 percent. It gets exciting to watch. I miss that dearly. KM: They see two minutes left on the clock and they’re just scrambling to finish the last of whatever they have to discover. We’re in there kind of cheering them on. AVC: Do you not run the rooms anymore? JB: We do on occasion, but because we’re building this new place [in Wisconsin], it gets most of our dedication. AVC: What makes those last few minutes so important? JB: Our one room can hold up to 12 people. In those last two minutes, when 95 percent of the clues have been solved, you can see a room of 12 strangers become one mind. They build a camaraderie, especially if they escape. AVC: How do people react when they fail? JB: I won’t say everybody’s doing cartwheels when they don’t get out, but they have fun. They come out and they want to come back and do the other room. Once you do a room escape, you get better. You learn not to overthink it. If they came out somber and sad, we probably would not be in the business. KM: We had one group early on that came back because they didn’t escape the first time. A girl woke up at 4 a.m. texting her friend about how if she did a puzzle differently she could have escaped. They get so riled up they wanted to do another room and they did and escaped. AVC: What advice do you give people looking to try an escape room? JB: Before a group goes into a room we give them the dos and the don’ts and take some time to give them helpful hints. We’ll tell them if two people are working on a clue, it’s sometimes helpful to get the whole room’s attention and say, “We’re stumped.” Nine out of 10 times, they’ll get an answer.